www.janetcharltonshollywood.com Want more details? Visit my bio and click on link! » Blog Archive » HALLE BERRY AND CLIFF WATTS: BUSINESS OR PLEASURE? HALLE BERRY AND CLIFF WATTS: BUSINESS OR PLEASURE? It’s been awhile since Halle Berry, 49, and Olivier Martinez split up and we haven’t seen her keeping company with any new men until now. Halle’s in New York and paparazzi surprised her leaving a restaurant (and holding hands) with photographer Cliff Watts. Watts is NOT a paparazzi – he shoots celebrities for magazines and directs commercials. 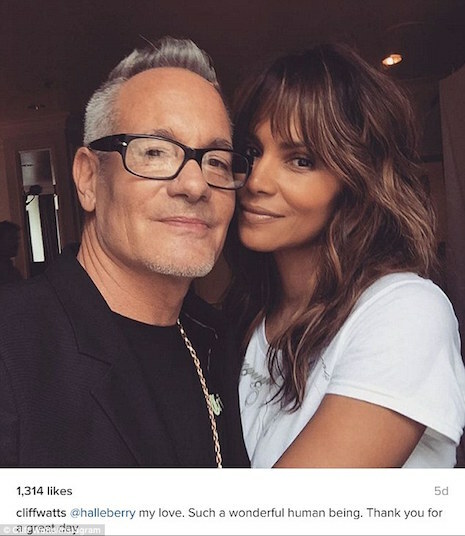 He seems fond of Halle – he posted a photo of them together on Instagram. We’re not sure if the dinner was strictly business or more than that, so all we can do now is speculate. I hope Halle finds happiness. She has fame and wealth and created a family only it has come with a big price tag and a lot of bad publicity. Sad that she has to be the one paying her 2 baby daddy’s child support. She is beautiful and has fame but not lucky in love so far. Hopefully things will change for her. Any Man wanting to start a relationship with this unstable Woman needs his head examined. Is he wearing a toupee? Whatever….she will drive this one away soon enough. In the beginning, everything is sugar and cream….and then the cream spoils and here we go again….adios and on to the next stupid sap. good god man, run. she will never be happy because no one can or will ever be able to live up to the perfect person she has made up in her head. she will never be able to appreciate what is in front of her.